Nicholas Cross has settled into a laid back civilian life, living off his savings and taking his time finding a new role in life, but is still haunted by nightmares of his time in Iraq. Thinking he's escaped a life of danger having survived an ambush that left many of his team dead, he isn't prepared for the way things unravel when he agrees to help best friend Thomas Abelard investigate the apparent suicide of a young actress on the verge of hitting the big time. As the pair uncover details of her life that even her boyfriend knew nothing about the death toll starts to mount, making it clear there is more to her death than it first appeared. Her killers are scrambling to cover something up, but can Nicholas stay ahead of them and the authorities while the pair try and expose the murderers and protect a witness?This is a pacey action thriller where the author not only gradually reveals the secret that is worth murder and torture but also keeps the reader in suspense about Nicholas' past and his previous identity, teasingly providing the odd hint here and there. However by the end the reader has been taken on quite a ride and discovered plenty, although some of Nicholas' unanswered questions about events in Iraq remain. The end leaves the door wide open for a sequel, but completes the first book in a satisfying manner. I put my kindle down feeling there was a definite sense of completion to this book and that it could be read as a standalone story, although I'm sufficiently hooked to want to read the next one.Nicholas and Thomas make for a likeable duo, and I particularly felt for the former both for his slight envy of the latter's relationship and for the decisions he has to make in the course of events. Both come over a savvy ex-military men who are applying their skills on civvy street. Nicholas' ex flits in and out, providing the men with kit that wouldn't be available to just anyone like something from a Bond film. I liked that she was one of several strong female characters, although their roles were minor in comparison.The writing pulled me in, with the flashbacks and dreams providing great background without taking away from the current events too much, and the book is polished (I only spotted a couple of minor typos.) The balance between providing description and moving the plot along worked well for me, although as events came to a head I find myself a little overwhelmed by military call signs and acronyms. I think that would probably be my only real criticism, as I felt I was distracted from what was happening as the explosive climax was reached while I tried to remember who was doing what where and how. 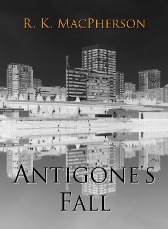 However I'm sure in due course readers of the blog will be seeing a review of sequel The Praetorian Agenda. Nicholas Cross is a slacker--laying low in Tacoma, living off his savings and the odd job, successfully avoiding the specter of gainful employment. But when his best friend, security specialist Thomas Abelard, brings him onboard a freelance murder investigation that reveals a trail of broken corpses and treacherous politics, Nicholas will have no choice but to remember the man he used to be. And that man is not someone you'd want hunting you.R. K. MacPherson uncovers his protagonist's past like a master chef gently peeling layers from an onion--but this onion has a tactical nuke at its center. Get ready for a fast-accelerating ride into high stakes and real consequences for Nicholas Cross and everyone he cares about. The afterword promises a sequel, and you can bet I'll be queuing up to buy it. R.K. MacPherson - R. K. MacPherson is a writer in the video game industry (Aion; TERA) in Seattle. He draws upon an array of experiences and careers in his writing, hoping to bring as much authenticity as possible to the work. He received his B.A. from Pacific Lutheran University and did graduate work in anthropology at Eastern New Mexico University. He's traveled and worked around the world, but currently resides in Japan, where he's researching his next novel.